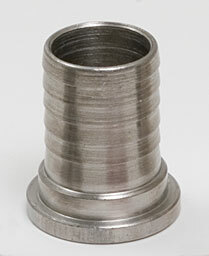 This stainless hose barb fits our L86 _" NPT NUT to help complete a _" hose barb fitting. Besides this hose barb, you will also need 1 L86 Nut and 1 L11 O ring to complete this fitting. I have a few of the older Blichmann connectors. I simply put a little silicone hose over the nut so that I could disconnect it when it is hot. Then Blichmann changed to the new (read more expensive) design. Then I found these. They are better than the original Blichmann connectors because the gasket stays in them, plus my silicone trick still works so they are just as good as the new connectors, but much much cheaper.